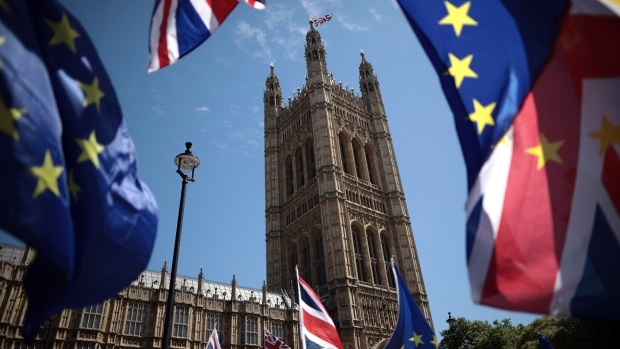 More than 800,000 people signed an online petition urging the government to cancel Brexit, with support rocketing in the wake of Theresa May’s statement on Wednesday. Whatever the prime minister hoped to achieve from her address to the nation, in which she blamed members of Parliament for the impasse in the Brexit process and told people who voted for Brexit that she was on their side, it’s unlikely she expected a slew of celebrities to urge their social media followers to oppose her plan. Parliament’s petitions website repeatedly crashed as the number of signatures shot up -- fueled by endorsements from singer Annie Lennox, actor Hugh Grant, science broadcaster Brian Cox and comedian David Mitchell. In just a quarter of an hour on Thursday morning, the tally of signatories rose by 20,000, as the link to the petition went viral on social media platforms including Facebook and Twitter. The tally passed 836,000 shortly after 12:30 p.m. Underlying data showed the most signatories coming from areas that supported remain in the 2016 referendum, including Edinburgh, London, Bristol and Cambridge. But there were also thousands of supporters in Leave-supporting areas such as northeast England, the Midlands and Wales. Data also showed signatories in countries around the world, from Afghanistan to Zimbabwe, suggesting not all may be U.K. voters. Any petition exceeding 100,000 signatures is eligible for debate by Parliament. It’s then up to a special Petitions Committee comprised of rank-and-file lawmakers to decide whether one should be held. May’s office was clear that she has no intention of revoking Article 50 and keeping Britain in the EU. “We have said probably 12,000 times in this room -- and she has probably said thousands of times herself -- that is something she is not prepared to do,” the prime minister’s spokeswoman Alison Donnelly told reporters at a briefing in Parliament. --With assistance from Robert Hutton.